Everywhere a battle, Ole Mother Earth has some wars*. Everywhere there’s distress, Ole Mother Earth has some wars*. Everywhere despair, Ole Mother Earth has some wars*. Everywhere Hope, Joy, Peace, and Love, Ole Mother Earth has a God! There is reason for hope! In spite of what our five senses may be telling us God is alive and well! He has not gone on vacation to some galaxy millions of light years away God is here and now! And God is still in control! 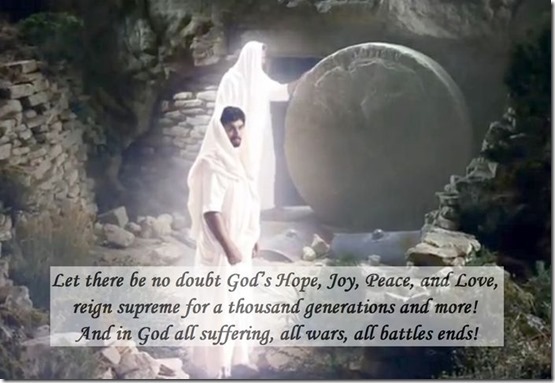 Let there be no doubt God’s Hope, Joy, Peace, and Love, reigns supreme for a thousand generations and more! And in God all suffering, all wars, all battles ends!